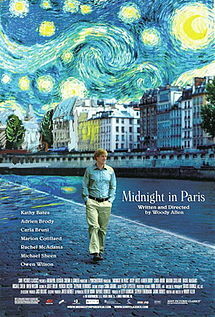 Recently I watched Woody Allen’s latest film “Midnight in Paris” in which the central character (Gil Pender), during his visit to Paris with his fiance’, manages to slip back in time to the Paris of the early 1920s. There Gil meets the greatest of the worlds literati during the period like F. Scott Fitzgerald, Ernest Hemingway, Gertrude Stein, Pablo Picasso, Salvador Dali and many others. Gil always thought that the 1920s was the golden age of literature and art and Paris was the center of this world. It was Gil’s dream come true. There in the 1920s Gil falls in love with the beautiful Adriana, Pablo Picasso’s lover. But to Adriana of the twenties, the golden age was “la Belle Epoque”, the European revival during the late 19th century. By a twist in the tale, Gil and Adriana travel back to the “belle Epoque” era to Maxim’s and meet Edward Degas, Toulouse Lautrec and Paul Gauguin, the great artists of the period. But when asked, these great artists say that to them the golden age was the period of Renaissance! So it seems, that to each generation the golden age belongs to the past. We often think that our past was much better than what we have today. Is it because that only the good things of the past remains in our memory, as the Bengali proverb says – Smriti Satatoi Sukher? Is it that we always tend to forget the miseries of the past? In the film at one point, when Adriana refuses to return to the future, Gils tells her, they have no antibiotics. Or is it, that we are so backed up in our knowledge that we tend to overlook the great things that are happening around us. We fail to recognize the beauty of the wonderful creations that keep on happening all around us. We always tend to belittle modernity in favor of the past. Nostalgia is good, but it should not blind us from enjoying the beauty of our period. All ages are golden ages, in their own right. So let’s enjoy what we have right now. Let’s appreciate the creators of our times. Let’s not hold back our creativity just because some other genius has created something similar in the past. Let the past be our inspiration and not a deterrent to our creative motivations. This entry was posted in Generic and tagged Art, Bengali, film, literature by sudipta. Bookmark the permalink. Beautifully stated. I too just finished watching Midnight in Paris, Woody Allen’s lettre d’amour to all things Parisian of the past—the art, the music, the literature, the cultural/intellectual zeitgeist. Part of the reason for this time travelogue, of course, is Allen’s own desire and need to be considered intellectually and culturally significant. This is something that both Allen detractors and lovers know all too well. I think we all have a certain passion for nostalgia that emanates not from failing to appreciate contemporary art, but from finding something in the past that speaks more powerfully to us than anything today could. For me, I have had an affair with the jazz music of the 1960s—especially the so-called Blue Note blowing sessions of that era. I still listen to contemporary jazz, but more often than not I spend the majority of my music budget on reissues and previously unreleased pieces from that time. The same with film. Objectively, the Technicolor (for example) of movies from the late ’30s through the ’50s is superior to the washed out hues of current film. This is true because Technicolor became too expensive and ceased being used. Plus the gritty realism of films starting in the ’60s was better captured by less gaudy colors (and by black and white, as well). Also, certain genres of film just don’t exist anymore. Film noir is but one example. The dark crime oriented capers of the ’40s through the early ’50s have been the subject of extensive research and documentation. Naturally the more time you spend in the past, the less time you have for today. Then again, reverence for the past can give you a fresh perspective with which to view contemporary artistic reality. Not to mention, but the culture of the past can be reinvented by the technology of the present and turned into a new art form (as with rap music). Anyway, kudos to Allen for this sweet, thought-provoking little film; and kudos to the NY/NJ Bengali writer for summing up the film and the issues presented so succinctly.